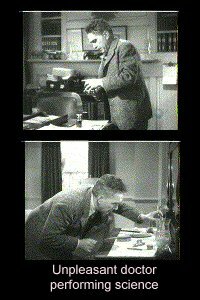 In this, the 2cd installment in the "Captive Wild Woman" cycle, veteran character actor J. Carrol Naish does an inept mad scientist routine in lieu of John Carradine. Much psuedoscience goes on, a lumbering retarded man by the name of Willy wanders around and likes things VERY MUCH, seemingly unrelated lion-taming goes on as if it mattered, and our hero "Bob" does things he isn't too proud of. Oh, and it's short. lando5> Hmmm...that's fascinating...now go away. Can't you see I'm doing science stuff? 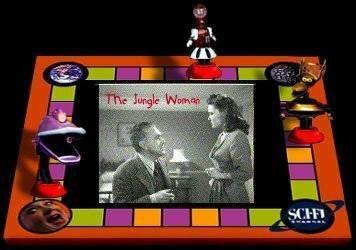 Groatleg> with Douglass Dumbrille as "The Jungle"
BryanL> Acquanetta? Isn't she one of Prince's musicians? Balthasar> And now, more aimless wandering in the bushes. THX-1138> The good old days of science, before switches, lights, and buttons. lando5> gasping...the mark of a master at exposition. lando5> "Not being a scientist, you are intellectually inferior, and thus incapable of understanding 'I did it.'" BryanL> And the movie takes the stunning action down 8 notches. Balthasar> Tonite, the part of Dumb Guy will be played by German Guy. BryanL> Anything that can help my turtleneck research? lando5> And thus, King Kong Lives...I throw myself on the mercy of the court. BryanL> Interesting pacing. Murder, sitting and talking. Wild animal attack, sitting and talking. Groatleg> Step right up and get your fetid creamhorns! Balthasar> So, the ape thing turns out to be Raymond Burr, right? lando5> So...every time he goes into the cage, he gets knocked cold...this is the basis of his career? Groatleg> He should just understand once and for all that lion-taming is just NOT one of his skills. Jamie> They need to wrap this trial up before Dr. Mason returns from lunch. BryanL> Maybe this lion tamer should have started out in banking, and worked his way up to lion taming gradually. Balthasar> Annie Oakley called-she wants her hat back. lando5> the girl frightened me...she didn't wear hats...that scared me. BryanL> It's kind of a fascist word association thing. lando5> I decided that I could accomplish more by killing everyone, thereby silencing the voices in my head. Balthasar> So, instead of hallways, this movie uses paths in the woods? Jamie> Warren Beatty IS Tommy Kirk IN Merlin Jones! THX-1138> This is so The Usual Suspects. BryanL> So he obsesses over the ashtray, and gets rid of the guy she reacted to. Good move. lando5> We walked around the yard, looked behind a couple of bushes, then decided to call it a night. THX-1138> Her voice resonates in my head and it hurts. Groatleg> now drink deeply from this thick broth we call "Jungle Woman"
BryanL> Has anyone figured out the connection to the lion taming scenes yet? Balthasar> Willy, we hardly knew ye. Of course, that goes for all the rest of them, too. lando5> I'm about to launch into some protracted technobabble, Bob...get your dictionary out. Groatleg> watch as they turn the Universal backlot into a GIANT MUD PIT! Jamie> only the sci-fi channel would take these movies..... welcome to the edge! THX-1138> The moral of the story - tamper with nature. "To you, Mr. district attorney, my story might border on what I'm sure you'd call fantastic!" "I injected adrenalin... probed for the bullet..."
"I learned that Shiela, the ape, was still alive..."
"You're letting your imagination run away with you! Take it easy." "Much useful knowledge... The study of plants and their effect on the human body." "I was both startled and suprised to see... Willy... approaching with a young lady..."
"Keep watching it long enough... it's color seems to change from a black to uh... brilliant blue..."
"An animal must've disturbed the birds or something." "If I were God I'd give every Joe like me a canoe like this..."
"I'm not ready to say just yet. It's all part of an experiment."